Henri Jozef Machiel Nouwen (Nouen), (1932–1996) was a Dutch-born Catholic priest and writer who authored 40 books on the spiritual life. Nouwen's books are widely read today by Protestants and Catholics alike. The Wounded Healer, In the Name of Jesus, Clowning in Rome, The Life of the Beloved, and The Way of the Heart are just a few of the more widely recognized titles. After nearly two decades of teaching at the Menninger Foundation Clinic in Topeka, Kansas, and at the University of Notre Dame, Yale University and Harvard University, he went to share his life with mentally handicapped people at the L'Arche community of Daybreak in Toronto, Canada. After a long period of declining energy, which he chronicled in his final book, Sabbatical Jou Henri Jozef Machiel Nouwen (Nouen), (1932–1996) was a Dutch-born Catholic priest and writer who authored 40 books on the spiritual life. Nouwen's books are widely read today by Protestants and Catholics alike. The Wounded Healer, In the Name of Jesus, Clowning in Rome, The Life of the Beloved, and The Way of the Heart are just a few of the more widely recognized titles. After nearly two decades of teaching at the Menninger Foundation Clinic in Topeka, Kansas, and at the University of Notre Dame, Yale University and Harvard University, he went to share his life with mentally handicapped people at the L'Arche community of Daybreak in Toronto, Canada. After a long period of declining energy, which he chronicled in his final book, Sabbatical Journey, he died in September 1996 from a sudden heart attack. His spirituality was influenced by many, notably by his friendship with Jean Vanier. At the invitation of Vanier he visited L'Arche in France, the first of over 130 communities around the world where people with developmental disabilities live and share life together with those who care for them. In 1986 Nouwen accepted the position of pastor for a L'Arche community called "Daybreak" in Canada, near Toronto. Nouwen wrote about his relationship with Adam, a core member at L'Arche Daybreak with profound developmental disabilities, in a book titled Adam: God's Beloved. Father Nouwen was a good friend of the late Joseph Cardinal Bernardin. 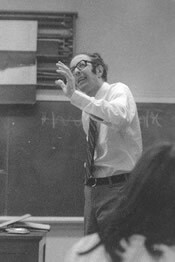 The results of a Christian Century magazine survey conducted in 2003 indicate that Nouwen's work was a first choice of authors for Catholic and mainline Protestant clergy. One of his most famous works is Inner Voice of Love, his diary from December 1987 to June 1988 during one of his most serious bouts with clinical depression.